1. 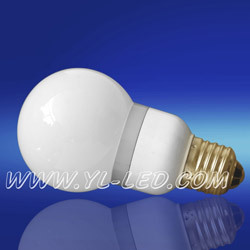 Use supper bright LED, low power consumption, long using life (Theory value: 5-10 years). 2. Use solid state seal, covered with PC material (not easy break up), Anti-ultraviolet, guard against high temperature, moisture and waterproof. 3. Inside drive controller, be provided that a lamp can shine with seven kinds of colored ray (red, blueness, yellow, green, blue, white, purple) and a led bulb shines five homochromous rays with red, yellow, blue, green, white. The color is abundance, softness, pure. And have strong decorative effect. 4. Use electromagnetic compatibility design, achieve green environmental protection. 5. Cover of bulbs may choose glass or PC material. 6. Bulb’s voltage and lamp head can be produced by clients' demand. The exterior of bulbs and using way is the same as incandescence lamp. It is widely used in advertising signboard for bright light project in the city, the building outline (a point instead of line) and ideal decorative lamps for proscenium background light. 1. Specification: Φ60 H 110. 2. LED quantity: 6-21. 3. Power: 4-12W. 4. Voltage: 12V/ 110V/ 220V. 5. Operating temperature range: -20°C~+60°C. 6. IP Degree: IP62.